Jang Song Thaek’s execution, announced early Friday in Pyongyang, marked an unprecedented fall from grace of one of the most powerful figures in the country as well as its most serious political upheaval in decades. Jang was North Korea’s No. 2 official — behind only Kim. 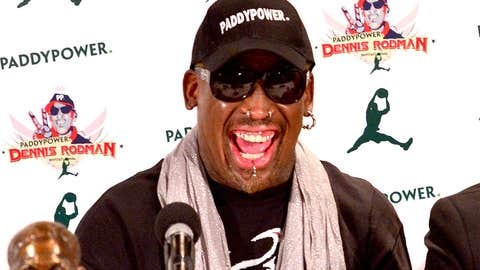 Rodman, known as much for his piercings, tattoos and bad behavior as he was for basketball, was the highest-profile American to meet Kim since Kim inherited power from father Kim Jong Il in 2011. He traveled to the secretive state for the first time in February with the Harlem Globetrotters for an HBO series produced by New York-based VICE television. "Yes, I’m going to North Korea to train the basketball team," he told The Associated Press by phone. "I’m going to bring American players over there. Yes I am. I’m going to be the most famous person in the world when you see American people holding hands and hoping the doors can be opened. If they can. If they can. If they can. I’m going. I’m going back for his birthday. Special."